I do hope that you understand. Incredible Detail and decals (see pictures). 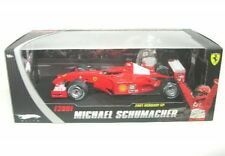 Hot Wheels 1:18 scale diecast Formula 1 model Ferrari F-2002 Michael Schumacher. Displayed since the day it was bought, like new condition. Adult owned from a pet and smoke free home. Paypal preferred. I usually am able to ship very next day after payment, HOWEVER I work full time and go to school so I am often only able to ship on tuesdays, thursdays, and fridays so please keep that in mind. I unfortunately do not ship to Alaska or Hawaii, sorry for the inconvenience. Feel free to ask any questions. MICHAEL SCHUMACHER COLLECTION GO KART GERMAN AND EUROPE CHAMPION 1987 1/18 SCALE. Condition is New. Shipped with USPS Priority Mail. BENETTON B192 w/ REMOVABLE PARTS. The model has never been taken out of the case and is in mint shape. After 6 winning seasons for Ferrari (6 Constructors'. Ferrari scored their lowest result in the constructors since 1995. ). It's just not possible. FREE scheduling, supersized images. The only flaws is the one of the antennas is missing. Scale is 1:18. The window on the box is missing. The left mirror is also missing. Was on display on a shelf for years. Looks like it was never removed from the box. FOR USA ONLY. Please look at description, there are more photos there!. T, Coulthard, Hakkinen, Alesi, Berger, Ferrari, Williams, Mclaren, Formula 1. - Sponsors: Ferrari, Fiat, Shell, Vodafone, Bridgestone. A Hot Wheels Racing Ferrari F248 car in the original box. Being sold as is, as shown. HOT WHEELS FERRARI F2003 #1. 1:18 DIECAST CAR. Car Condition: Mint / Near Mint with decal cracking on barge boards. Sold as pictured. Box condition: Display case has minor scuffing on top. FRONT WING CAREFULLY REGLUED AS IT WAS DETACHED FROM NOSE. (PICTURES 11 AND 12). (PICTURE 4 AND 9). Tamiya Collectors Club Edition, the model is fastened to a black plastic base. Opened only to take photos. This is a limited edition model made with no sponsors in honor of September 11th. This is a nice tribute to the best Formula One driver ever! Minichamps 1/18 Benetton Ford B192 1992 Monaco GP Michael Schumacher 25th Anniv.